NES Street Fighter 2010: The Final Fight (JPN) in 06:50.22 by MESHUGGAH & Challenger. Street Fighter 2010, completely unrelated to the fighting game series, is a unique game to say the least. 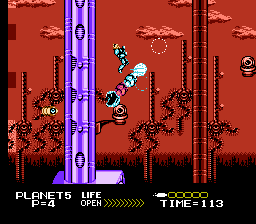 The player must go through a series of levels, collecting enough powerups to warp from one to the next. In this movie, MESHUGGAH & Challenger beat the previous run by nesrocks by 10:49.08 minutes. This major improvement comes from a new glitch only available on the Japanese game version, where it's possible to finish any level if you die and hit Pause on the correct frame.